Naturally sourced and formulated to improve working memory and cognitive functioning as well as support cholesterol and cardiometabolic health. 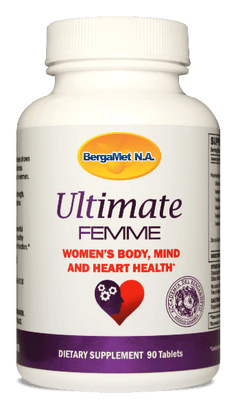 Animal studies and clinical trials demonstrate the active ingredients in BergaMet Ultimate Memory may help improve working memory and cognitive function while supporting a healthy cardiovascular system. The main components of BergaMet Ultimate Memory are naturally occurring, plant-based, patented extracts providing a unique combination of phytonutrients, including polyphenols and flavonoids. These ingredient combinations have been clinically tested to show support for neurological and cardiometabolic function. The health benefits of bergamot come from its unique profile of phenolic compounds, such as neoeriocitrin, neohesperidin, naringin, rutin, neodesmin, rhoifolin and poncirin. Naringin has been shown to be helpful in maintaining normal inflammatory balance, while neoeriocitrin and rutin have been found to exhibit a strong capacity for quenching free radicals and maintaining healthy LDL cholesterol levels. 90 Tablets per bottle. Take one (1) tablet three times a day with main meals.